The super-popular Sun Basket meal delivery has decided to start 2018 with a bang by expanding its offer to include even more gorgeous meals for the most popular healthy diets. Now, Sun Basket patrons who opt for the Classic menu can choose from as many as 18 delicious recipes. Furthermore, the service has introduced 3 new meal plans, including the Vegan, Pescatarian, and Mediterranean plan. 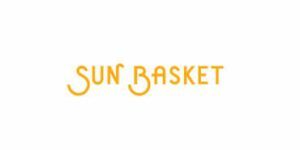 According to the words of Adam Zbar, the CEO and co-founder of Sun Basket, these major novelties come as a direct result of customers’ strongly expressed interest. For all of you who are excited about the great news, here are more details about the new plans. First, let us see what all 3 plans have in common. Namely, the meals included in these plans contain 550 to 800 calories per serving, at least 15 grams of proteins, 5+ grams of fiber, and no more than 800 mg of sodium. They are rich in good fats coming from healthy sources such as olives, nuts, avocados, and seeds. Out of 18 recipes on the weekly menu, 3 are designed for the Vegan plan. The recipes are incredibly creative, yet wonderfully simple and quick. 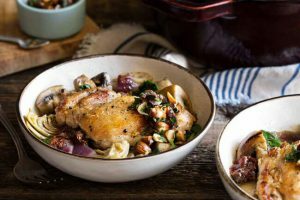 The meals can often be prepared in only 25 minutes and there are plenty of one-pan and one-pot wonders. All dishes are beaming with flavor coming from fresh, seasonal organic produce, gorgeous herbs, and house-made signature sauces. The Pescatarian plan is carefully designed to provide a perfect combination of the vegetarian diet and the best seafood available. The produce is fresh and organic and the seafood is wild-caught, sustainably sourced, and rich in omega-3 fatty acids. The recipes are just as easy and impressive as the ones included in the Vegan plan. 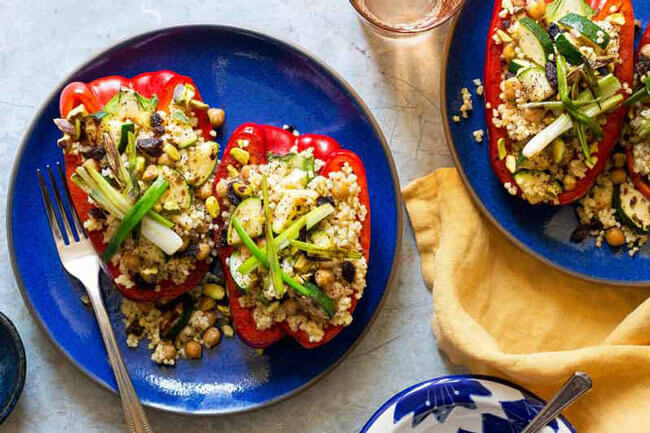 The Mediterranean diet is becoming increasingly popular in the US, so it is no wonder that so many Sun Basket customers expressed the desire to see more Mediterranean-inspired dishes on the menu. With this plan, you get to explore all the healthiest and most famous dishes of the Mediterranean cuisine and enjoy the benefits of introducing more lean meat, wild-caught seafood, whole grains, healthy fats, and fresh herbs into your diet. Known for extraordinary flexibility, Sun Basket allows its patrons to choose from the full range of recipes on the menu, so no matter which plan you choose, you have plenty of options at your disposal. Mediterranean today, vegan delights tomorrow, pescatarian when you are craving delicious fish – let the mixing and matching begin.